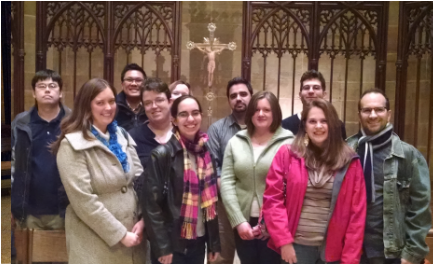 Welcome to Triple V - the Young Adult Group of St. Joseph Cathedral in downtown Columbus, OH! This great and vibrant young adult group formally started on All Saints Day in 2009 upon the request of the Very Reverend Michael Gribble, Rector of the Cathedral from 2000 - 2013. He had a vision for Young Adults who come to celebrate the Eucharist at the Cathedral to get together and serve as a beacon of light through their lives in the downtown community and in the Diocese. Celebrating the Eucharist and propagating Eucharistic Adoration. This is done by faithfully encouraging each member to be an active participant in the celebration of the Eucharist at all times. During our monthly events, we pray the Vespers before our activity. We also encourage our members and other young adults to participate in the Diocese's longest First Friday Sacred Heart of Jesus Devotion every First Friday at 7:30 PM at Holy Cross Church at 204 S. 5th Street. Understanding the Catholic Faith. We do this by having vibrant talks and discussions on the Faith and on topics that are very relevant to young adults. Sometimes, we take this opportunity for our members that have entered a vocation to speak to us of their experiences and their stories as to why they entered such vocation. Living the Catholic Faith. We do this through activities with Catholic organizations such as J.O.I.N. in gathering clothing items for the poor and in need, through St. Vincent de Paul Society Cathedral Chapter's food programs for those at Bryden House and at St. Lawrence Haven, and through the Catholic Social Concerns' Service Saturday program (allotting time to extend assistance to those in need of chores for the elderly or for those who are not capable of performing the task physically) throughout Franklin County which happens twice a year. Performing Pilgrimages. As Catholic, we have a lot of beautiful pilgrim sites and undiscovered sites worth making a pilgrimage to. The definition of a pilgrimage is a journey to a sacred place as an act of religious devotion. Our pilgrimages are made to deepen our faith and love in Christ in the beauty, serenity and importance of the sacred sites visited. Socializing and Participating with other Young Adult Group events throughout the Diocese. We do this by joining other group events like Theology on Tap, Credo or the Diocesan wide Young Adult Retreat held earlier this year. We also organize sports event outings, picnics at the park or big downtown events get togethers just so we have time to unwind and get to catch up with each other in an atmosphere conducive to conversing with each other. As we begin our 5th year, we will continue to be visible through the parish community and to the diocesan community as whole. If you are not a member of the group yet, do consider signing up via the membership form link in this website. We understand that not everybody is interested in solely talks or solely adoration or solely pilgrimages, etcetera thus the diversified activities we have throughout the year. There is something that one may want to participate or may want to do. This is the group in a nutshell! We hope that you would actively participate in our upcoming activities or join our email distribution list! See you soon! The photos above were taken on 17 November 2013 after the 10:30 AM Mass. This is to celebrate the 4th Year Anniversary of the Group. The luncheon celebration was held at Tip Top Restaurant a couple of blocks away from the Cathedral. Also, this was the weekend that we were collecting donations and items for J.O.I.N. There is still time to bring in your donations, so let JP know if you have anything for him! Feel free to e-mail him at yagroup.stjosephcathedral@gmail.com. Any donation items will be gladly accepted!